Driving back in time through Montana’s gold rush country. 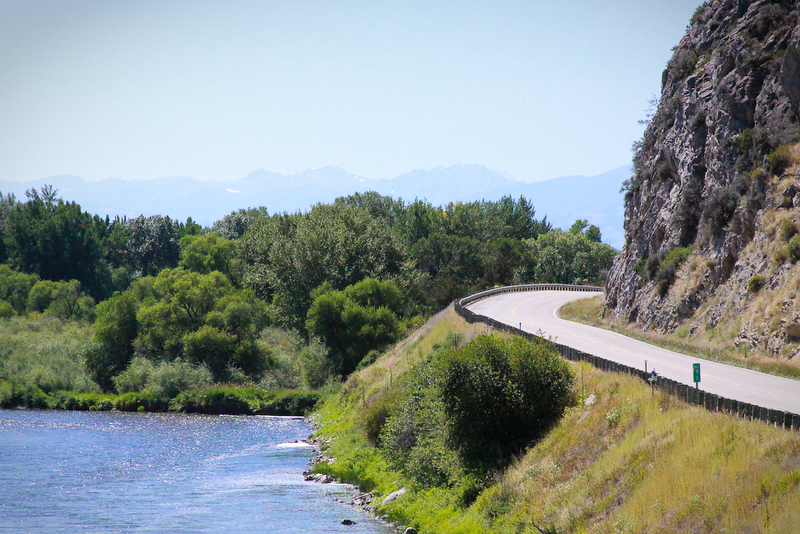 Highway 287 winds its way into Montana’s Gold Country. A cabin stands in a field, just off the highway. Its doors and windows are gone, and sunlight filters through gaps in the thick timbers. Its roof sags under its own weight. 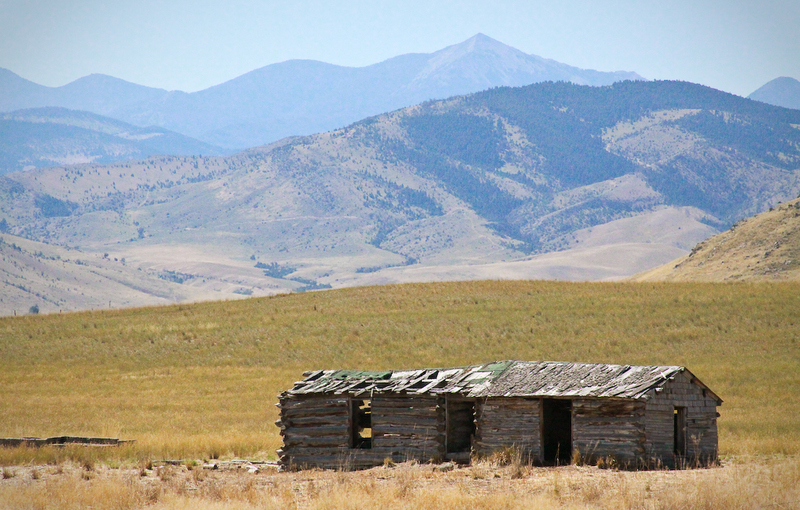 Behind the cabin, Montana’s Tobacco Root Mountains rise like a painted backdrop. Brown foothills dusted with pine trees give way to jagged gray peaks in the distance. The road and a barbed-wire fence are the only other human structures in sight. I’m on highway 287 heading south from Three Forks into southwest Montana’s gold country. I grew up in Montana, and in all that time I’d never driven this road. Since moving back east four years earlier, I’d regretted how little I’d explored my home state, always venturing outward on my travels. On a trip home to visit family and friends, I found myself with a few extra hours. I decided it was time to check out the line on the map that I’d missed. I pull my car to the side of the road and get out. Pickup trucks pass creating gusts of wind, and I can guess what they think as they swing by. Tourist. Locals don’t stop for this stuff. I’m no tourist, I think. But that’s exactly what I am today. To me, this cabin with the mountains in the background is worth pulling over for. It’s a glimpse into the past, where ranch-hands may have slept between driving cattle, and raising hell in nearby towns. Back east, buildings like this are mostly gone. The ones that have survived get restored, turned into museums and filled with artifacts. There would, at least, be a sign describing settler life. In western Montana, it is nothing more than a dilapidated cabin forgotten on the side of the road. One of many. Abandoned Cabin near Lewis and Clark Caverns, Montana. Back on the road, I get the feeling that the gold rush this area is known for is a mere pinpoint on the historical map. The boom and bust lasted only a few short years. Behind the miles of barbed-wire fence lays a chronology of the area’s long agricultural history. One field has A 1946 GMC stake-bed sunk up to its rounded fenders in the dry soil. Next to it, a 1952 Ford pickup lies flat on the ground, its tires long-since turned to dust. Then, a 1964 International rests beside two mid-seventies Fords, one with a caved-in windshield. An early nineties Chevy missing its fenders looks almost drivable. Like tree-rings, these trucks tell the history of a ranch, including the relative prosperity in the 70’s followed by the much leaner days of the 80’s. The makes and models of the trucks differ, but every ranch I pass has a line of them. I head up a short rise into the foothills of the Madison Range. The highway crosses nearly dry Burnt Bradley Creek and tops out with a view down the wide Madison River valley. After living buried in the thick forests of the east coast, I try to comprehend the scale before me. Mountains rise thousands of feet to my left and right. Even through the haze of nearby forest fires, I can see the Madison River as it winds its way through the valley and disappears into a canyon headed toward Yellowstone National Park thirty miles south. It looks fake. I ride the brakes as the road descends toward the ranch town of Ennis. The human landscape changes as dilapidated out-buildings are replaced by garden sheds. Rows of rusted-out Chevys become weed-tangled bicycles and red-plastic motorized jeeps. I drift through downtown passing old-west-looking storefronts with names like “Reel Food on the Fly” and “Rocky Mountain Antler Museum.” Ennis has a dusty-realness about it that most tourist-driven towns lack. I half-expect a tumbleweed to roll across the street. Ennis is the home of the Madison Valley Beast, a mysterious creature that allegedly went on a cattle killing spree in 1886. 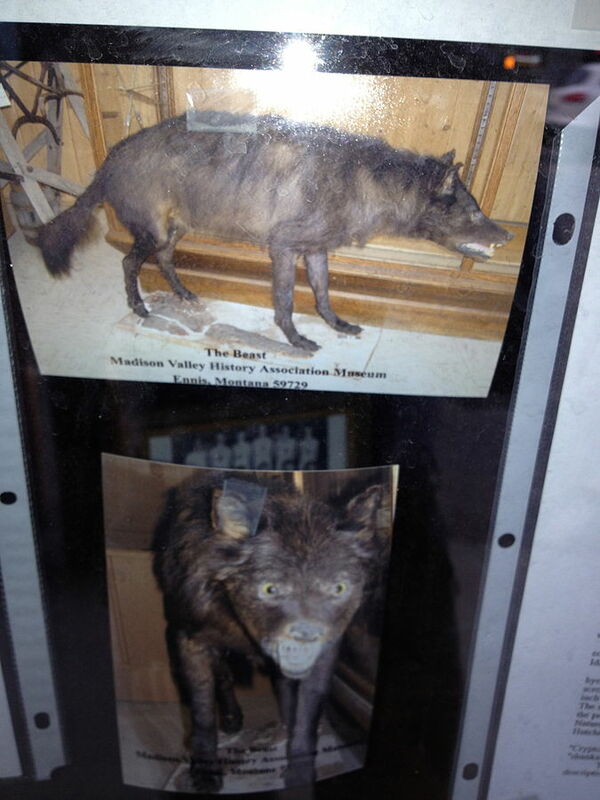 The species of the Beast has never been identified, but photos of the Beast are taped to the The Madison Valley Historical Association wall. People have speculated that the Beast may have been a hyena escaped from a traveling circus, though the image looks, to me, like a cross between a mangy cattle dog and a very angry pot-belly pig. Either way, the Beast’s reign of terror was brought to an end by local rancher Israel Hutchins when he shot and killed it, (after accidentally shooting one of his own cattle.) He reportedly had it stuffed and mounted for display, after which, it was lost for decades. It turns out, the Beast is still on the lam. Hutchins’ grandson, Jack Kirby, is said to have tracked the stuffed Beast all the way to a museum in Pocatello, Idaho. He supposedly returned it to the MVHA, however, he creature has yet to be seen, except in the photos. I like to think that the beast is mounted in a local cowboy saloon, forgotten except by the owner who has no idea that the beast belongs anywhere but over his bar. Highway 287 turns west and heads up a winding pass into a notch between the Gravelly and Tobacco Root Mountain ranges. Prairie grasses cover the land as it folds into gulches that had, at one time, lured gold miners from all over the United States with their promises of quick fortunes. I drop into one of those gulches and follow it into Montana’s most famous ghost town, Virginia City. While other Montana ghost towns stand alone, abandoned and decaying after the mines played out, much of Virginia City looks like the freshly-built set of an old west movie—one where the period-costumed characters liked it so much they never left. This is Montana’s equivalent of a restored colonial village in Massachusetts or Delaware. Tourists can witness a gunfight, or watch taffy being pulled by a lady in a bonnet. The difference is that there’s no fence separating it from the modern town of 150 year-round residents. No ticket-sellers stamping wrists. 1880’s saloons with tall facades stand next to vinyl-sided houses with sprinklers fanning the lawns. While Virginia City is a tourist trap, its sole purpose doesn’t seem to be extracting money from people, but letting them wander around a part of town that just happens to be stuck in the 1880s. One of the most interesting buildings I see is one that restoration hasn’t touched. 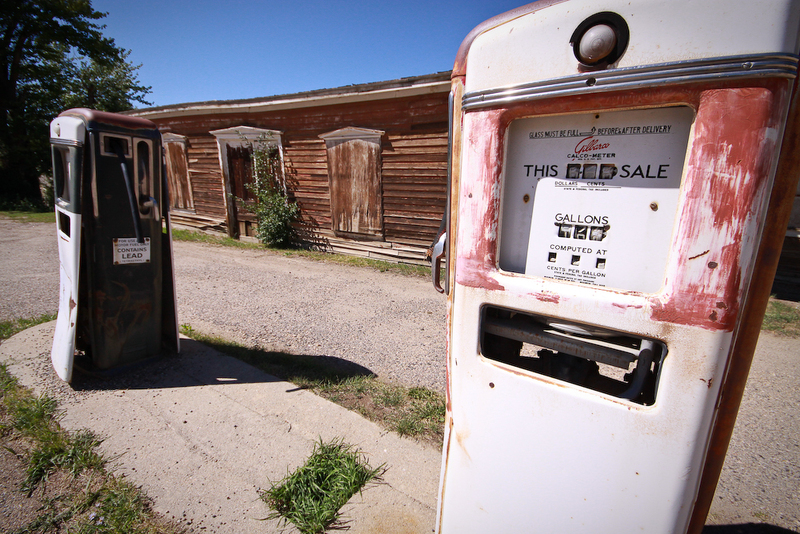 Two 1940’s gas pumps sit outside of a boarded-up service station at the edge of town. Red paint flakes off one of the pumps, and the tumblers are frozen at its last fill of 9 and 9/10 gallons. The station must have closed about the time that Virginia City was being turned into a tourist destination. With its covered windows and peeling clapboard siding, the only building aging naturally is the one that symbolizes Virginia City’s transition between the old and the new. The highway continues west, curving along the gulch and entering Nevada City. The original Nevada City is long gone, having been dredged away in the search for gold. What I see as I pull to a stop is a collection of rescued historic structures from around Montana. Cabins like the one I saw near Three Forks have been relocated here, and placed on display with a mixture of buildings from different eras, like some kind of zoo. Rather than tearing down old buildings, Montanans just put them out to pasture. 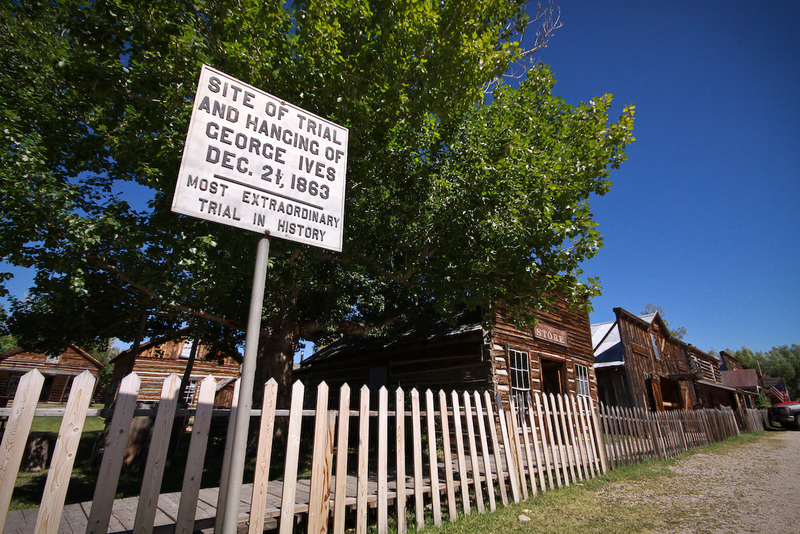 The buildings may not offer any more than superficial historical context, but in the parking lot there is a sign that reads: “Site of trial and hanging of George Ives Dec. 21, 1863. Most extraordinary trial in history”. The trial took place before any real justice system existed in the territory, and was handled by a miners’ court. According to historical accounts, in order to allow the whole community to attend, the court was held outside in the chilly Montana winter. The judge sat in a wagon, while the jury huddled around a bonfire. Even after Ives had been strung up, many people in the community were frustrated with the proceedings. Two days later, the Montana Vigilantes took to the streets hanging dozens of people in Bannock, Virginia, and Nevada Cities. While this brutal civilian justice subsided when the territory enacted a formal legal system in 1864, Montana still reveres its vigilantes. If you look closely, you can find the Vigilantes mysterious symbol, “3-7-77”, in all kinds of places, including on the Montana Highway Patrol shoulder patch and flight suits of the Montana Air National Guard. There are many theories as to the origin of the symbol, but one thing was clear, if you saw “3-7-77” painted on your tent in 1863, you got the hell out of town. What I’m starting to realize, driving through this part of the state for the first time, is that in Montana it’s not a contradiction that the symbol of the lawless west is painted on the back of police cars. Montana’s history of self-determination isn’t really history, but the fabric that modern life here is cut from. I continue west following Alder Creek out of the gulch and into a green, heavily irrigated valley. At the town of Alder, the highway turns north along alfalfa fields and stacks of hay bales drying in the sun. I cross the Jefferson River and roll into Silver Star, Montana’s third oldest, continuously-occupied town. Founded in 1866, the city was a major draw for gold prospectors during the rush. Gold fortunes, and population, have long since played out, and what’s left appears to be the world’s largest salvage yard. Two-story-tall wheels from some behemoth machine stand upright along the highway, dwarfing semi-trucks as they pass. They seem to act as a levy, holding back a tidal wave of discarded mining equipment, broken dump trucks, and rusting train parts. This is the mining equivalent of trucks parked in hay fields. The refuse isn’t attractive, even with the Pioneer Mountains as a backdrop. But discarded equipment is part of Montana. There is a certain industrial beauty to broken down machines that, while not always pretty, adds real context to the landscape. I have no doubt that, if I was allowed access to that field of junk (and my tetanus vaccination was current), I could follow the flow of events from the first miner to scoop river sand into a pan right up until I pass through Silver Star, leaving the tiny town getting smaller in my rear-view mirror. I clicked on this picture because it looked so much like where I live in the grasslands in SE Arizona. I can tell I’m going to enjoy your blog!